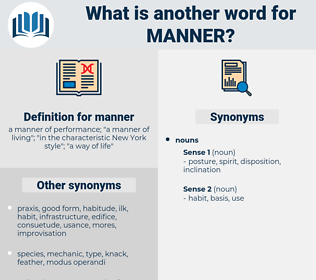 What is another word for manner? 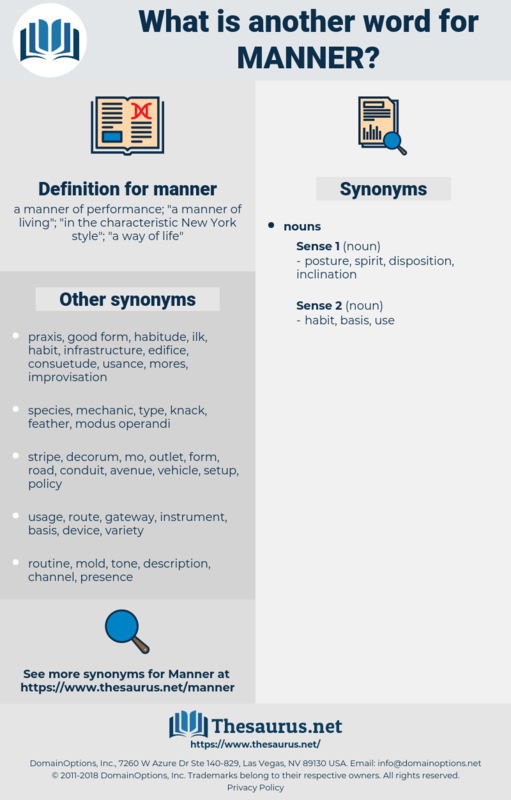 a manner of performance; " a manner of living"; " in the characteristic New York style"; " a way of life"
instruments, characteristics, preconditions, prerequisites, dimensions, avenues, Standards, Resources, rules, Facilities, inputs, tools, mode, modes, ways, means, method, methods. Telecommunications, Vis, attitude, extent, vein, kind, spirit, perspective, matter, sense, nature, mode, response, sort, accordance, token, behaviour, interpretation, contribution, method, measure, environment. So much for what a boy may do, by only a few right words spoken at the right time, and in the right manner. I do not love any one in that manner. murre, man hour, murrow, moneyer, menhir, more, manure, menurae, monario, maar, mar, merry, mayor, menura, mr, memoir, moon-ray, miry, mohair, moire, moirai, menorah, moore, mari, meir, morrow, mohria, minor, mimer, memory, mummery, monomer, Mr., meniere, mayer, muir, marrow, mwera, mere, mare, maori, munro, mower, miner, moray, mary, monera, miro, myanmar, monroe, mirror, moirae, mara, mimir, maria, menorrhea, moon ray, mummer, mire, Mary Ii, maimer, murray, Mary I, marry, moaner, miri, Moro, moor, mainer, mammary, myrrh, mri, marri, manor.